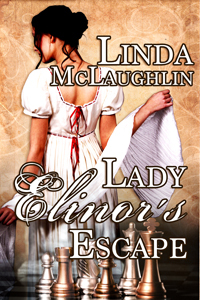 I’m sharing an excerpt from Lady Elinor’s Escape where Elinor meets her hero for today’s MFRW Book Hooks and for Book Quote Wednesday. This week’s word is tight. Elinor turned to face the gentleman who had suddenly appeared. She stared at him through a haze of black, taking advantage of her veil to get a closer look at this tall, dark-haired, seemingly well bred gentleman. He was above average height, with finely chiseled features, and while he could not, strictly speaking, be deemed handsome, there was something in the intense scrutiny of his light brown eyes that drew her to him. By the cut of his bottle green Superfine coat, which emphasized his broad shoulders but was not so tight as to hamper movement, and his casually tied neckcloth, she surmised he was no society dandy. “How do you do?” she said politely, extending one black-gloved hand. As he took her hand and bowed over it, Elinor savored the warmth of his touch for a moment. It had been a long time since someone had touched her out of kindness. Suddenly realizing she was clutching his hand, she withdrew hers. He studied her, his gaze seeming to penetrate the veil, and she could only stand like the veriest lump under his scrutiny. “Really,” he drawled, doubt evident in his tone. “Yes, I have a position awaiting me in London.” She was surprised, and a bit uncomfortable, at how easily the lies flowed from her lips, but they were necessary. Available from Amazon, BN/Nook, Kobo and Smashwords. Click on the linky list below for more MFRW Book Hooks!